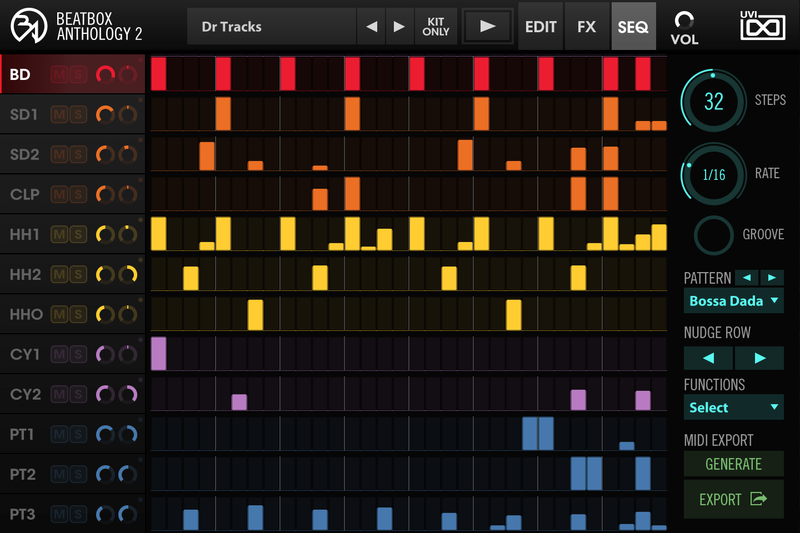 An incredible collection of vintage, modern and customized drum machine sounds representing over 50 years of grooveboxes, beat machines, drum modules, synth drums and more, from analog to digital, mainstream to obscure, BeatBox Anthology 2 delivers them all in an extraordinarily versatile and easy-to-use percussion instrument. 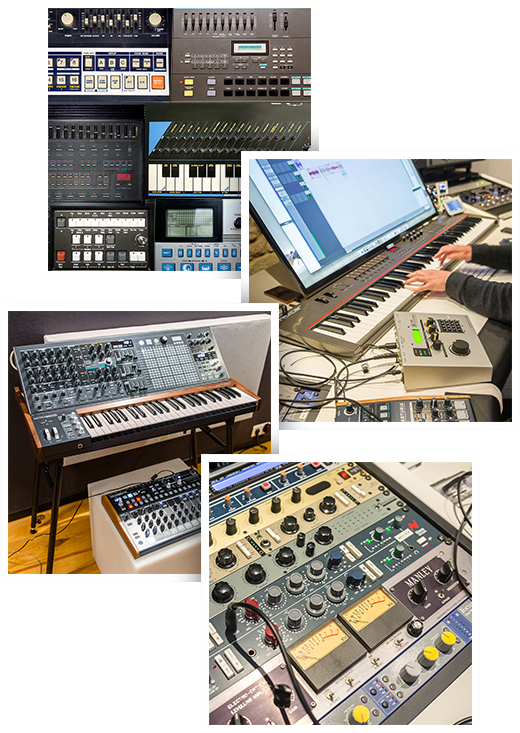 Explore the history of hardware drum synthesis while you design your own kits, layer different machine sounds together, and even create entirely new hybrids with precision envelopes and sample offsets, all with expertly recorded and exquisitely sliced samples that deliver the authentic and unmistakable sound of hardware. 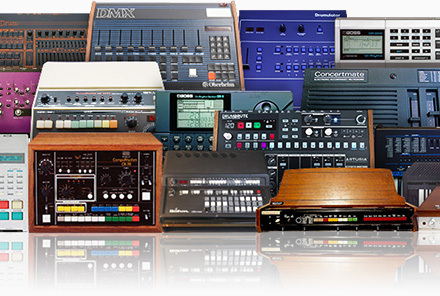 Over the past half century hardware drum machines have exploded in popularity, complexity and breadth of application. 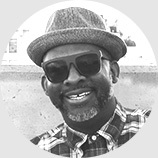 Beginning as humble organ accessories they now define entire sub-genres and represent unmistakable cultural icons. 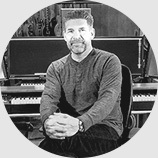 Their sonic ranges having evolved from simple analog clicks and pops to analog-digital sampler hybrids capable of generating nearly any sound imaginable. 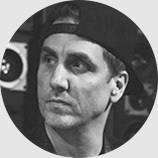 In short, they’ve revolutionized the way we make music and forever changed our musical landscape with their unique voices. Hailing from every corner of the globe these machines are the foundation of BeatBox Anthology 2, a beat fiends dream, delivering a comprehensive collection created with more than a hundred models ranging from ‘60s prototypes to the current generation of future classics. Each machine was meticulously inspected and serviced to ensure the best performance possible before being handed over to our sound designers. After exploring the sonic capabilities and unique traits of these machines our team deeply sampled and processed them with the highest quality equipment available, including premium DI boxes, hardware processors and ADCs. Each sample was then hand-trimmed and sculpted to perfection, accentuating the soul of these machines with a mastered finish. 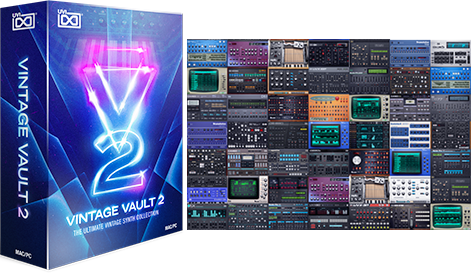 The result is over 200 sonically decadent kits and 11,000 samples, each with a clear, impactful hardware sound. 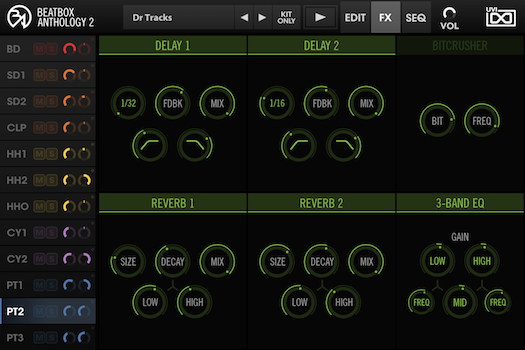 BeatBox Anthology 2 has been designed with a sleek and ergonomic unified interface to help you hit the ground running. 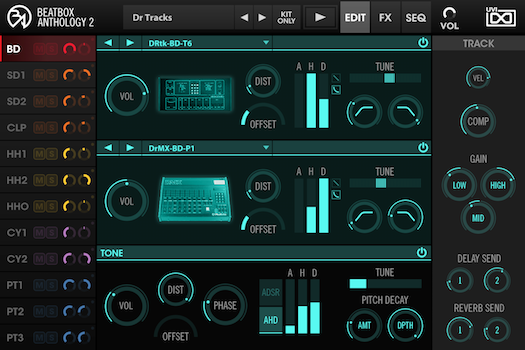 Spend your time being productive and making music instead of navigating complex menu structures and mastering a dizzying number of voice topologies. 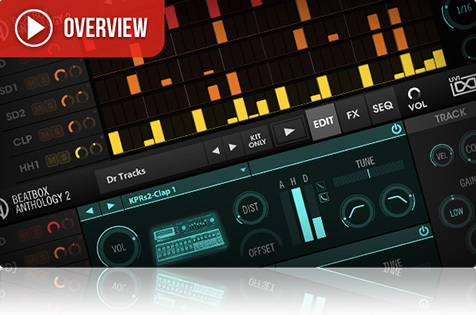 Quickly browse the library by machine or drum type to find fuel for your inspiration, easily master the unified editor page to sculpt, tweak and create new sounds with up to 3 layers, add fx, then program beats up to 64 steps long with the built-in sequencer – even drag-and-drop the MIDI to your DAW of choice! 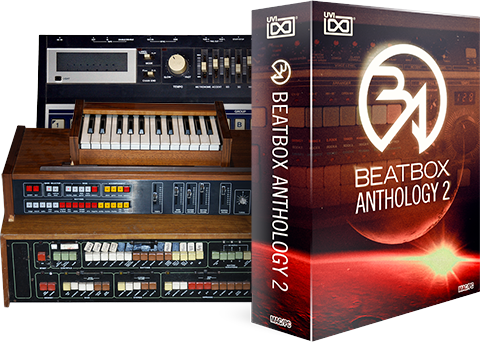 For the majority of users the factory kits and patterns will have you covered, but for those that want to go deeper BeatBox Anthology 2 provides an extraordinarily powerful and flexible 3-oscillator architecture on each of its 12 tracks. The bass drum and snare tracks each sport 2 discrete sample layers and a unique tone generator, allowing you to easily control the fundamental pitch, while the remaining 9 tracks offer 3 sample layers each with independent volume, pitch, distortion, HPF and LPF filters, sample start time (offset), and AHD envelope with switchable decay shape, allowing you to sculpt, layer or blend any of the drum samples together to create entirely new hybrids, all with real hardware sounds. 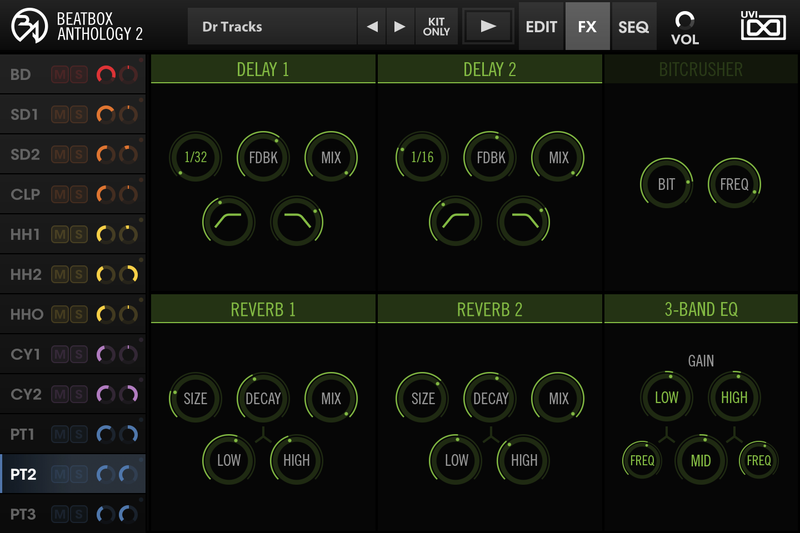 BeatBox Anthology 2 includes a lean and mean variable 64-step sequencer loaded with preset patterns. Whether you just need a basic sequence playing while you design your kit or you want to go deep and create finished beats for your track it’s both fast and easy to use. 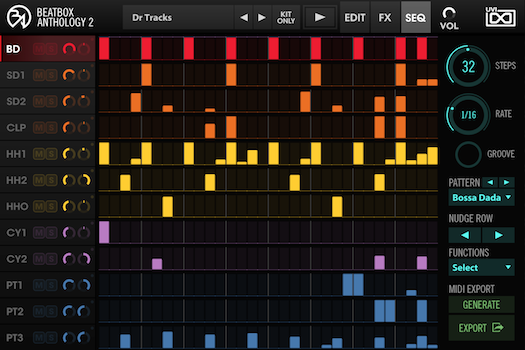 Quickly set your pattern length, load a preset or sketch in your sequence, nudge tracks, apply functions, and when you’re done you can drag-and-drop the MIDI directly to your desktop or DAW. 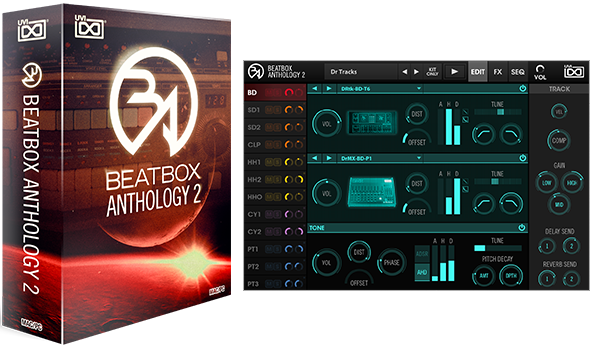 BeatBox Anthology 2 delivers a massive collection of pristine hardware drum machine sounds wrapped in a powerful and modern software instrument, giving you incredible sounds out of the box and a deep toolbox to explore entirely new territory. UVI BeatBox Anthology 2 | How Does It Sound ? 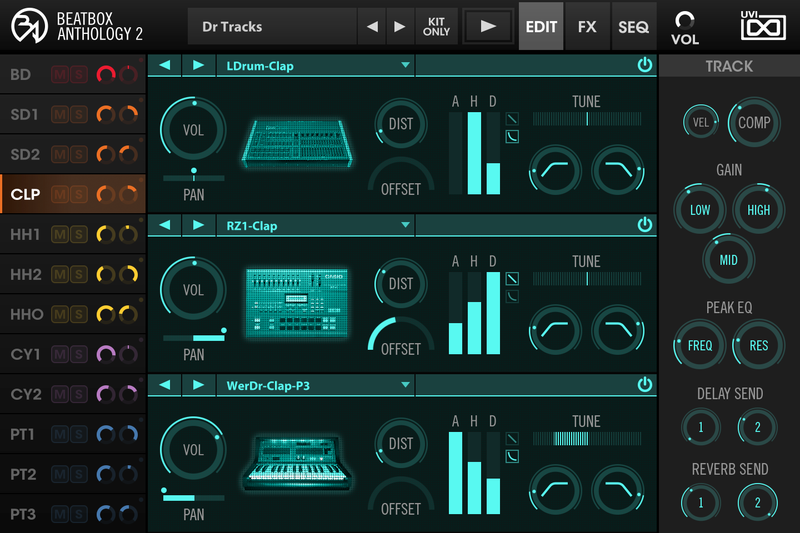 "BeatBox Anthology 2 is quick and easy to use, but also sonically flexible." 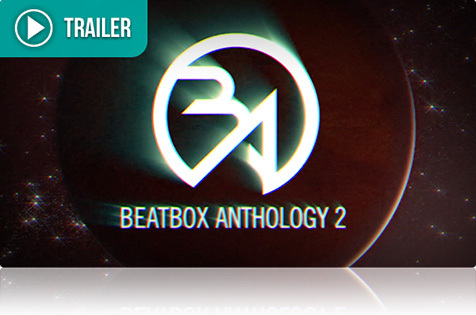 All sounds in BeatBox Anthology 2 are original creations of the UVI sound design team.